On Wednesday, September 3, 2014 we hopped on the bus with Ms. Guthrie and headed for Crooked Creek for the chum salmon egg-take. It was cold, wet, and windy, but we knew we would have fun. When we got there Fishman, Mr. Baer, and Jr. Baer were ready to catch some fish. They asked for volunteers with boots to hold a net. It was easy to catch the male salmon, but not so easy to catch the females. It was late in the season and a lot of them had already laid their eggs. Two volunteers helped to take the eggs and milt ( a substance the males carry to fertilize the eggs). The eggs and milt were put into a pitcher. Fishman and Baer ate some. Yuck! Water was added and the eggs were fertilized. Fishman rinsed them off. They brought one of the salmon up, and a lot of people kissed it. Some students tasted the eggs too. We learned about the external parts of a salmon and their functions. 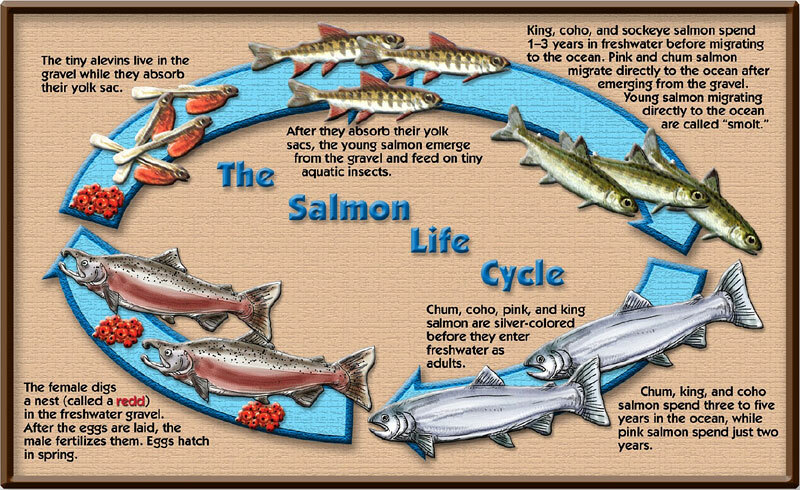 We also learned about the different kinds of salmon. We jumped back on the bus and headed back to the school where the salmon eggs were placed in a chilled aquarium to incubate. It was a fun, rainy day!